A classroom used as a prayer room at Liberty High School in Frisco got the attention of the Texas attorney general’s office last week. The office sent a letter raising constitutional concerns about the room. The Frisco superintendent called the letter a “publicity stunt” and said the prayer room has been in use for several years without complaints. Prayer rooms are just one way public schools in Frisco and across Texas accommodate students and religion. Tim Boyer was so unhappy about the prayer room at Liberty High that he went to this week’s Frisco school board meeting and spoke his mind. 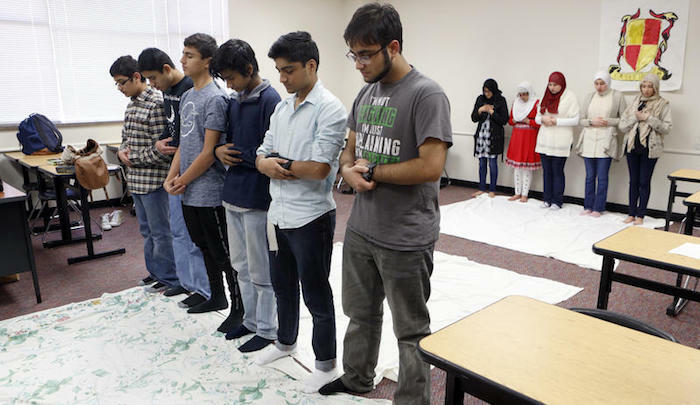 The Frisco Independent School District has said it didn’t violate any state or federal laws by having a prayer room and that the room is open to students of all faiths. It’s not clear how many public schools in Texas have prayer rooms or designated areas where students can pray, but they are in some schools across the state and country. Baskin said prayer rooms in schools are acceptable and legal under the First Amendment. Schools can also give students time to pray, whether it’s during free time or a lunch period. They can give students passes to leave class to pray or leave campus for religious education. “There are students in Texas who’ve asked to be excused all day on Fridays, every Friday, in order to attend religious services on Friday and most districts have considered that an undue burden because of the amount of class the student would miss,” Baskin said. Liberty High School established a prayer room in part because Muslim students were leaving school on Fridays to pray and were gone for about two hours. It’s actually a classroom that’s open to students when it’s not being used for instruction….